England recovered from a shaky start thanks to the efforts of Moeen Ali and Joe Root to finish the day at 284/4 after being down 22/2 in the first session of the match. Ravindra Jadeja was the star performer on the day finishing the day with figures of 3/73 in an incredible 28 overs. After securing the series in Mumbai, India made two changes to the squad with Ishant Sharma and Amit Mishra replacing Bhuvneshwar Kumar and Jayant Yadav, who got his maiden hundred at the Wankhede. England, too, made a couple of changes after being under fire throughout the week by bringing back Stuart Broad and handing a debut to Liam Dawson with James Anderson and Chris Woakes had to make way for the English duo. England won the toss for the fourth time in the series and unsurprisingly elected to bat first on the damp Chennai pitch. Off the very first ball of the match, Cook completed 11,000 runs in Test cricket with a couple of runs off a shot to mid-wicket. But that was the only bit of happiness that the English camp would enjoy in the opening session of the match. First, Ishant Sharma sent Keaton Jennings packing after the Englishman tried to drive at a fullish delivery only to manage an edge that Parthiv Patel gobbled up easily. Cook was struggling as well facing two appeals in two consecutive overs from Sharma and Ravindra Jadeja, but he managed to survive them. After taking England's score to 21/1, Cook eventually succumbed at a mere score of 10 when he edged a Jadeja delivery to Virat Kohli in the slips. England were struggling to read the spin on Jadeja's balls and could have been down to three wickets in the opening 15 overs of the match but KL Rahul misjudged the flight of the ball to give Moeen Ali a lifeline. Ali along with Root began settling the innings and started a blockathon taking the score to 68/2 at the end of the first session of the match. The Root-Ali duo came out for the second session with a renewed rigor as they settled into a familiar format of just protecting their wickets and getting the odd boundary now and then. India's struggles with DRS continued as Jadeja convinced Kohli to opt for one although Parthiv Patel appeared to be against the decision. Eventually, Kohli did ask for a review and Patel was right with the ball clearly hitting the pad outside the line of off stump. Root got to his fifty with a flat sweep through midwicket, while Ali was playing a patient game reaching his 23 off 68 balls. England, at this point of time, had managed to reach a score of 94/2 in 36 overs. Both players had gotten into their stride and started picking up the pace by rotating strike on a consistent basis and a boundary every now and then. Ali reached his fifty as well taking England's score 157/2 in 51 overs. Just at it looked like England had finally clawed their way back into the game, Jadeja struck gold again. Root's attempt to sweep a Jadeja ball resulted in the Englishman hitting the ground and Patel caught the ball that had looped up. The umpire sided with the batsman but Kohli quickly reviewed the call. UltraEdge picked up a spike and the Umpire had to reverse his decision. Root made his way back to the dressing room but did not look the least bit happy with the decision, and England ended the second session with 182/3 on the scoreboard. Ali and Jonny Baristow took the guard for the English in the last session of the day, and after a slow start the latter started playing his full range of shots, smashing Ashwin and Jadeja for two big ones in consecutive overs. Kohli got Karun Nair into the attack in an attempt to get a breakthrough. When the gamble failed, he turned back to Mishra, who had bowled just seven overs in the 74 and the leggie caught Ali in front of his stumps. The batsman was adjudged not out even after the review was taken. It was Jadeja yet again who got India the crucial breakthrough with the wicket of Bairstow, with the Englishman one run short of his fifty. 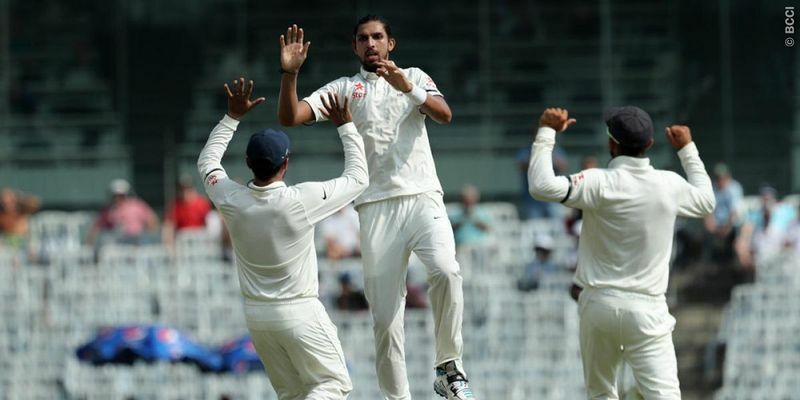 Ali, however, continued to defy the Indian bowlers and got to his fifth Test hundred off an Amit Mishra delivery. India took the new ball five overs after it was due, but it seemed to have a counter-effect on the Indians as Ali put two consecutive balls past the boundary rope to take England past 270. They eventually ended the day with a score of 284/4, which would please the visitors more after a terrible start to the match.